I enjoyed your use of the photo to make your point. When I read the comment in your post that the underlying point can be extrapolated to all of Europe, I put the two things together and remembered Easter services several years ago in the Cathedral in Madrid. Not counting my family, there were more people in church in your photo than were worshiping in church in Madrid on that holiest of days. It's no bloody wonder we see things differently than Europeans do. You have to admit, Europeans gave religion a bad name. Between Constantine's conversion and today, they've produced quite a few corrupt episodes. Between that and their desire to be 'rational' it's not surprising that the pews are empty. perhaps,it depends upon where in Germany? i was there this past Fall. 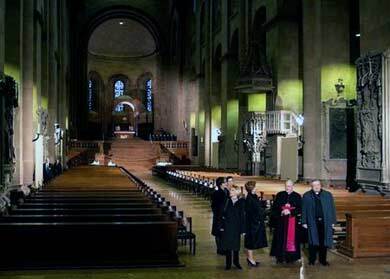 We happend to be in Nuremberg for All Saints Day and the Church was packed, not to mention that everything was closed. Maybe it is not the belief or disbelief in God, but rather the amount of religious fervor?